$500 air-conditioning allowance for a week stay. Charge if exceeds. 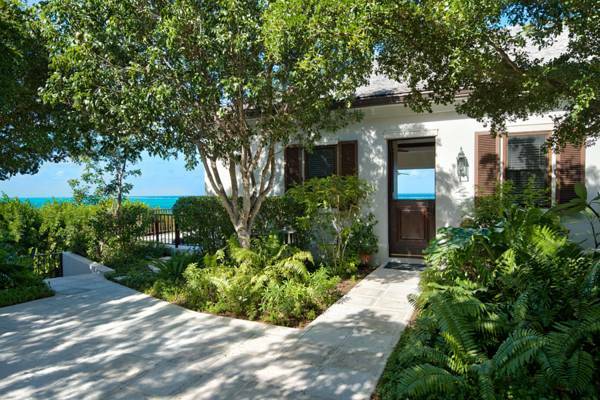 This luxury villa near Blue Mountain has extraordinary views of the north coast of Providenciales. Its high elevation offers a far reaching view to the northern ends of the island and cool breezes drift up from the ocean below. The villa’s name, Gwynt A Mor, means Wind and Sea in Welsh. A gated driveway leads up to the 4-bedroom property. Limestone patios and pathways surround the villa and its gardens. The pool looks out over the ocean and the covered pool patio provides a perfect place to relax or dine surrounded by water. The living area and kitchen have wide glass doors that open directly onto the pool patio. Spacious and fully equipped, the kitchen is fitted with stainless steel appliances and the kitchen table provides an ideal place to eat breakfast. The dining room, with an 8-person table, has doors that open onto a leafy patio. Three of the bedrooms have king size beds, and the fourth has two twin beds (which can be combined on request to form a king bed). 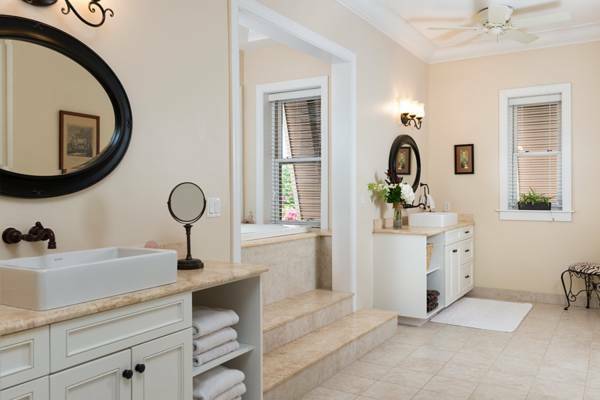 There are four bathrooms, and two are ensuite. Amenities include a full size tennis court, basket ball area, gym facility, BBQ grill, outdoor fire pit, and indoor media room. In addition to ocean breezes, the villa is kept cool with ceiling fans and air-conditioning. There’s also fast Wi-Fi, televisions, and a DVD player. Gwynt A Mor is situated on the central coast of the island which makes it an efficient location for those interested in exploring the whole of Providenciales. Quiet and secluded Babalua Beach lies down in front at the base of the cliff. Blue Mountain Hill, the highest point on the island, is right nearby. Turtle Cove Marina with its activities, restaurants, casino, and shops, and the excellent Smith’s Reef snorkeling site, are just to the east and a short drive away. To the west is Blue Hills leading all the way to North West Point National Park. The scenic Chalk Sound National Park and the shallow warm waters of Sapodilla Bay Beach are within a 12-minute drive. An equal distance away and you’ll be in the heart of Grace Bay. If you’re looking for a vacation home in a central but quiet location on Providenciales with a view to behold, villa Gwynt A Mor offers just that. Master Bedroom: King bed with en-suite bathroom. Bedroom 2: King bed with en-suite bathroom. Bedroom 4: Two twins (can be made into king). Bathoom 1: En-suite in master bathroom. Bathroom 2: En-suite in bedroom 2. Bathroom 3: Shared in bedrooms 3 and 4. Bathroom 4: Located in gym room. Great! The Villa was delightful, clean, kitchen with enough to host a wedding. Pool sunny, and owners very helpful. Our biggest complaint was having to leave.